Of course we have bugs (and other critters) on Roatan. A lush tropical Island, surrounded by soft white sand beaches, nestled in the Caribbean Sea. The temperature average high 28C (82F) with an average low of 24C (75F.) Keep in mind that the humidity level is always up there too. What better conditions for bugs to thrive in. Here is a list of a few of the ones I encounter, some regularly, others just once or twice so far in the past three years. I don’t know the technical name for them (and I don’t really care.) Some are known by more than one name. And the behaviours that I describe are based on my personal experience with each, nothing more. I will never claim to be an expert. They are tiny and fast, hence the name no seeums. Everyone reacts differently, but in my experience when one or more get me, the initial sensation is of a sharp sting. Keeping in mind it is relative to their size. The bite gets itchy for a few minutes, and a raised red dot appears. The itching and dot disappear within ½ hour. Sand fleas, flies, no seeums are definitely annoying. The closer to the beach, sunset, and days with no breeze are when you are more likely to encounter them. When I walk on the beach in Sandy Bay, I wear a light weight, long sleeve shirt to protect my arms and back. I put coconut oil on my legs. Any oil will work (they get trapped and suffocate.) I have found that commercial bug repellents (with or without DEET) do little to deter them. Some beaches, in particular West Bay, regularly rake the sand (disrupting the eggs) this goes a long way toward keeping the numbers down. Everybody knows what mosquitoes look like and how it feels when one gets you…itchy, itchy, itchy. Here on Roatan, the mosquitoes are smaller and faster than the ones I’m used to in Ontario, Canada. When they are most active (rainy season) the worst time is at night. A few will manage to get in the cabana and sure enough, I will have just fallen asleep and a mosquito starts buzzing right next to my ear. I do the most logical thing of course…smack myself in the head. I never succeed with getting rid of the mosquito and I feel ridiculous for having hit myself so hard. But it just seems to be a natural reaction that I can’t control. I do think it annoys them though, so the mosquito, or two, or three, will head for my toes and ankles. It’s not uncommon to wake in the morning with a cluster of their itchy little bites all over my feet. Malaria? It is possible to contract malaria on the Island. I believe there are different strains of malaria and I honestly couldn’t tell you which ones are present here. When it comes to taking medication to prevent malaria, spending as much time as I do on the Island it isn’t possible. The medication (from what I’ve been told is very hard on your liver) and cannot not be taken for an extended period of time. For anyone looking to visit Roatan for a shorter time, you should talk to your doctor and decide if malaria prevention medication is for you. Dengue is another mosquito borne illness that there is no prevention for and on mainland Honduras an alert has been issued. It has been highly recommended (on the mainland) to wear long sleeve shirts and long pants, as well as to avoid areas where mosquitoes are most likely to be and to use insect repellent. I personally choose to not use insect repellents (especially with DEET.) I don’t have serious reactions to being bit by either sand flies or mosquitoes and I’m more concerned about the ill effects of DEET. But that is my choice and should not be what you base your decision on. I can tell you (again, my experience) that since coming to Roatan three years ago, I know of only three people who have had malaria and all three described horrific flu like symptoms that after a few weeks they recovered from. I don’t know of anyone who has had dengue. Ants are definitely the insect I spent the most time with. There are so many varieties, each with their own special qualities. The names I use for these two may or may not be correct (again, I don’t really care.) It is just what I’ve come to know them as and all encounters are based on personal experiences here on Roatan. Sugar ants are itsy-bitsy little guys whose bodies must be all nose and teeth. They can sniff out the smallest particle of food (containing something sweet) and will come marching in to claim it. Every food item must be sealed up in container with a tight fitting lid or at the very least a zip-lock baggie. Leave anything on the counter for more than a few minutes and the sugar ants will claim it. If…no…when this happens, if you take the dish and set it in direct sunlight the sugar ants will scurry away, so all is not lost. You may be thinking to yourself, yuck, eating food that had ants in it, I’ll never do that. On Roatan…yes you will. It’s not possible to avoid. These little guys are pretty helpful too! Sugar ants took top honors on my list of awesome things about Roatan When ants cleaned the melted candy out of my purse. Army ants are amazing! Bigger than the sugar ants—they are on a mission. In the past three years I’ve seen them do their thing a couple of times…what a show! Here they come, hundreds (if not thousands) of them, marching single file up the stairs. They then split off into squads and begin the hunt. Don’t bother trying to stop them. They’re not interested in you (you’re too big.) They are coming in to seek out the other bug that may be in your home. It takes about an hour and then they are done, marching out as efficiently as they marched in. They will have rid your home of EVERY bug. You can try all you want to eliminate these ones from your home. Good luck…just remember they outlived the dinosaurs. The army ants coming through are your best temporary defence. What I still don’t understand is why coackroaches like to live in my scotch-tape dispenser—I keep that in a zip-lock bag now. I prefer to evict bugs rather than exterminate them—except when it comes to scorpions. When I mention scorpions to anyone from Texas or other areas where they have them, it’s no big deal. Everyone else freaks out, and I admit so do I! For some reason scorpions like to take a nap under my pillow. I got into the habit early on to check under my pillow before climbing into bed. This has paid off a few times when I have found a scorpion sleeping right where I was going to be laying. I run for the can of scorpion killer (yup, specifically for scorpions) and chase them down, spraying half the can on them. I do apologize as they take their final breathe—I feel bad for what I’ve done. But I admit I am terrified of getting stung by a scorpion and I won’t take the chance. So far, so good…never been stung! Spiders for the most part are okay by me—just the usual ones hanging around. They do their part to trap the mosquitoes and other pests in their webs. Running a broom around the ceiling to get rid of the webs every now and then is no big deal. I had an encounter with a spider recently however, that I will never forget! I was watching TV (while in bed,) checking emails on my laptop, when I felt something drop from the ceiling onto my head, then scurry away. Fortunately, I set my laptop aside before leaping off the bed. My immediate thought was, oh my God, a SCORPION! There was no way I was getting back on the bed until I found and got rid of whatever had landed on me. Cautiously I approached and with two fingers clutched the corner of a pillow to move it aside. What had landed on my head was under that pillow and made a mad dash to the headboard. Once I got over the initial shock, I moved in closer to get a good look (not too close though—I’ve heard tarantulas are good jumpers. 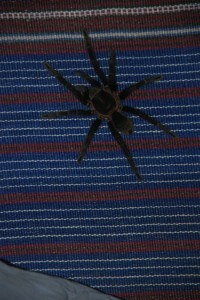 It was the size of my palm, covered in coarse black hair, beautiful multicolored lines on its back—I was impressed! I ran to get my camera and took a bunch of pictures from different angle (glad I have a zoom lens.) Having captured the moment…it was now time to evict the eight legged, hairy creature. I put an empty plastic ice-cream tub, over top of it and slid the tub along until I could put the lid on the container. 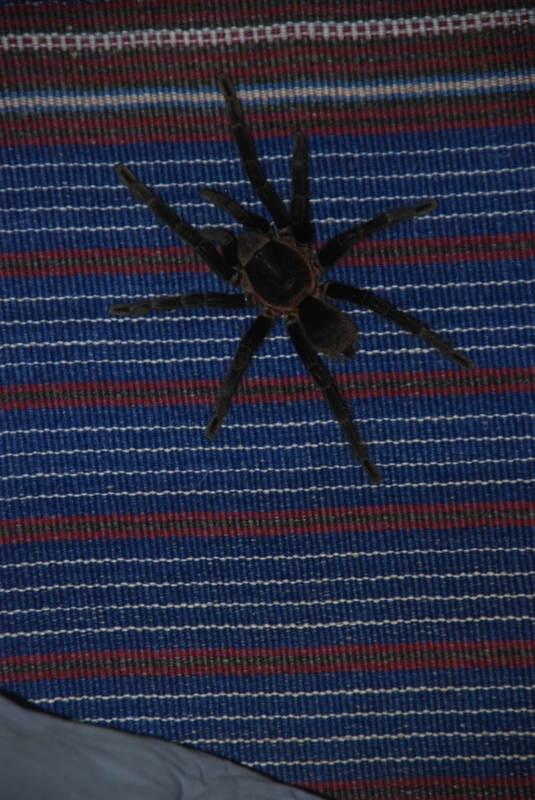 Carrying it outside…I set the tarantula free! I could tell you about a lot more bugs and other critters I now know of and encounter here on Roatan, but figured this was enough to give you a sense of what’s here. Will this make you decide to not come to Roatan? I hope not, that definitely was not my intention with this posting. The way I see it is that no matter where you go THERE ARE BUGS! They’re pretty cool actually and far more efficient at how they conduct their business than we are. Think about it…bugs contribute to nature…we’re the ones messing it up! Saw your blog and read until I got to the tarantula on your head. I am terrified of spiders, so this will, no doubt, cause me huge nightmares. Despite that, your island refuge sounds wonderful. I’m writing because of your comments on malaria, dengue, and DEET. Anyone traveling to areas where malaria and dengue are endemic should always use insect repellent. There are four recommended by the US EPA and Prevention–DEET, picaridin, oil of lemon eucalyptus and IR3535. These have all been tested for safety and efficacy — nothing else is reliable. DEET can be used on infants as young as two months of age in concentrations up to 30% (which gives you some idea of the level of confidence the Am. Academy of Pediatrics has in the use of DEET-based repellents. There are no age limits on picaridin. OLE should not be applied to those younger than three years of age. Hope this information will help you be safe from mosquitoes that carry disease…malaria and dengue are dangerous. I work for the DEET Education Program, Washington, DC. Call 800-789-3300 anytime for information on repellents and their proper use. Meantime, enjoy your paradise. Am envious! Thanks for the expert advise Judi. Like I said in my posting I am not an expert on bugs or insect repellent, just sharing personal experiences. About that tarantula. I would be doing the hebegebee dance for about 20 mins. While in Jamica I woke up with a rather large palmetto bug running across me and still get chills and flashbacks when I see big crusty type bugs. Yuck!! More power to you for setting it free. But I must say that no stupid bugs will keep me from moving to Roatan in 2014.